Rev. Gary W. Holden is the Founder, President and CEO of The Police Chaplain Program. Chaplain Holden completed the Law Enforcement Adjunct Instructor Training Program implemented by the U.S. Department Homeland Security Federal Law Enforcement Training Centers Office of Training Management. He is a trainer with the Department of Homeland Security Incidence to Terrorist Bombing (IRTB) classes. Chaplain Holden is a member and is trained in Pastoral, Group, Assisting Individuals in Crisis, Advanced Group Crisis Intervention, Advanced Assisting Individuals in Crisis, CISM Application with Children and Managing School Crisis: From Theory to Application with the International Critical Incident Stress Foundation and is an approved instructor. Chaplain Holden was awarded the prestigious Susan E. Hamilton, PHD Award by the ICISF at their World Congress in 2015, for his development of and work with police chaplaincy. Chaplain Holden is a member of the American Academy of Experts in Traumatic Stress and the National Center for Crisis Management. He is a counselor and chaplain with the New Jersey Disaster Response Crisis Counseling (DRCC) Team. Chaplain Holden is a member of the New Jersey Department of Homeland Security Interfaith Advisory Council. He served as a chaplain after 911 at Ground Zero in NYC working with the New York City Police and Fire Departments and the Port Authority Police Department. He is also a board member, Senior Chaplain and the Emergency Chaplain Corp. Chairman for The Four Chaplains Memorial Foundation in Philadelphia from which he received The Legion of Honor Bronze Medallion award for sacrificial service. Chaplain Holden was also involved in chaplain work with The Battleship New Jersey Museum in Camden, NJ. and is a regular speaker at patriotic events and services. He is the Sr. Chaplain of the Cumberland County Sheriff’s Department, a Chaplain with the New Jersey State Police and the Cumberland County NJ Prosector's Office. He founded the Public Schools Police Chaplain Resource Program. Perry was sworn in as the Chaplain for the Collingdale Police Department in 2010. In addition, since 2000 he has also served as the Chaplain for the Delaware County Fraternal Order of Police. Perry is a 1980 graduate of The Pennsylvania State University where he received a Bachelor of Science degree in Administration of Justice. 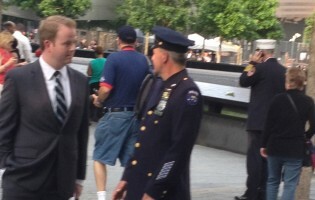 He was deployed to Ground Zero in New York City over a period of seven months in 2001-2002. In addition, after Hurricane Sandy, Perry was assigned to coordinate emergency response in Lakewood, New Jersey. Since 1996, Perry has served as a Senior Pastor in PA. Chaplain Messick serves as a board member and instructor with The Police Chaplain Program. Jason served in the United States Marine Corps from 1992-1996, the New Jersey Army National Guard 1997-2004 and the New Jersey Air National Guard 2004-2010. Jason also served in Operation Iraqi Freedom while in the Air National Guard 2006-2007 in Kirkuk, Iraq. His Law Enforcement Service includes the Cumberland County Sheriff's Department 1999-2000, Vineland Police from 1999-present. Jason spent the last 12 years on Patrol where he attended the following schools: Street Survival-Tactics for Winning Seminar, Drill Instruction School, Field Training Officer Preparation, Crisis Intervention, Bulletproof Mind: Mental Preparation for Combat, Crisis Intervention Team (CIT), Group Crisis Intervention (International Critical Incident Stress Foundation). Jason has been a Community Policing officer with the Vineland NJ Police Department and Liaison Officer with the Department Chaplain Program and has retired from the Vineland Department. He is an instructor and board member with our team. Jason is an ordained minister and the Senior Pastor of a New Jersey church. Chris graduated with a Bachelor's degree from Rutgers University and a Master's degree from St. Joseph's University in Criminal Justice. He was hired by the Maple Shade NJ Police Department in 1995 where he served in both patrol and investigative divisons working his way up through the ranks. Currently, Chris holds the rank of Police Captain at the Maple Shade NJ PD where he is the Chaplain Liaison Officer, Training Coordinator and Internal Affairs Commander for the agency. Chris is a valued consultant to The Police Chaplain Program.